Another mild month is ending, in fact its been the warmest ever November here, also the dullest. Going forwards its looking like a stormy and mild December to come. 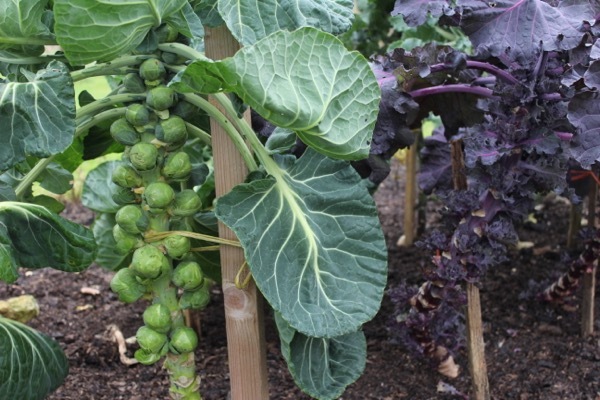 Temperatures are high enough for new growth on kale, Brussels sprouts, flower sprouts and leeks, while some purple sprouting that is due in February is cropping now. 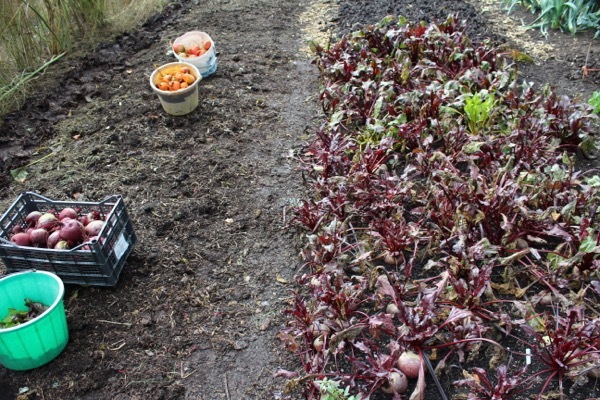 After any final harvests its good to feed soil and its organisms with well-decomposed organic matter, so that all the plot is covered by either a growing crop or compost. 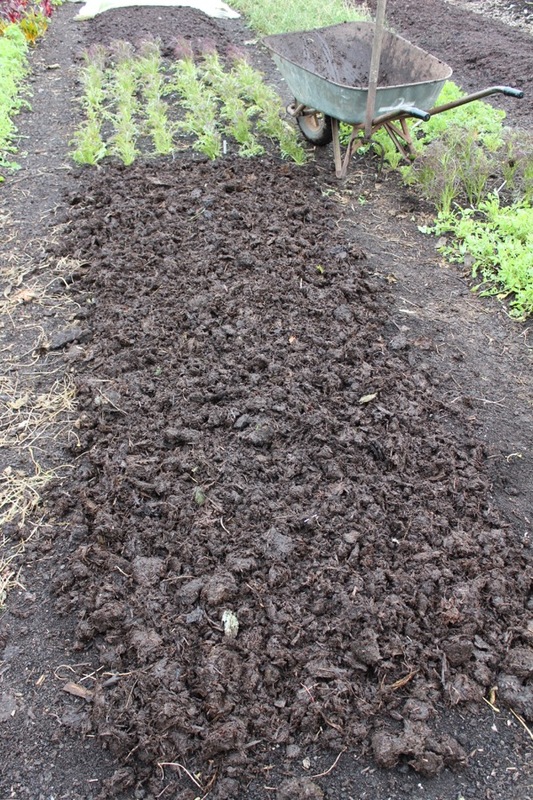 I just finished spreading some compost that I made in May and turned in June, its dark and crumbly. On other areas I am spreading some mushroom compost and old cow manure. 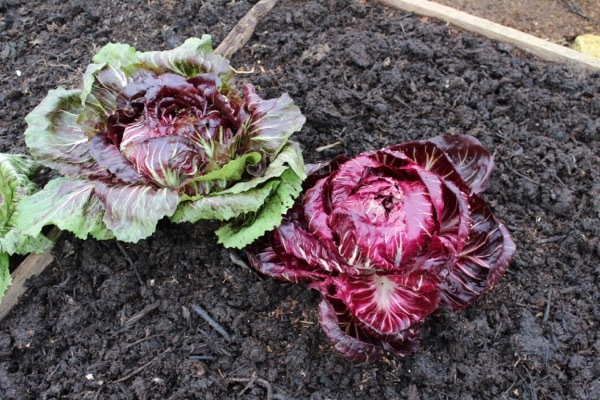 When spreading compost, use a fork to break apart any lumps larger then an orange. 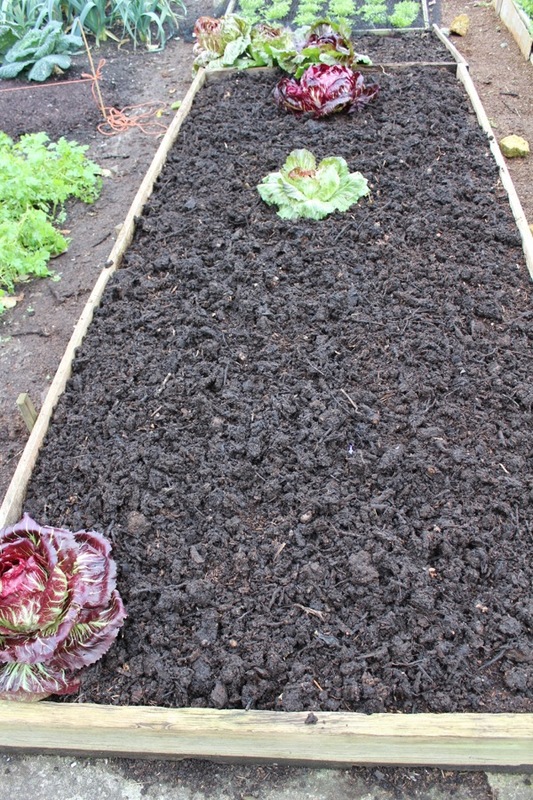 Then winter weather breaks the compost open even more so you can make a reasonably fine and super-soft surface for sowing and planting into. 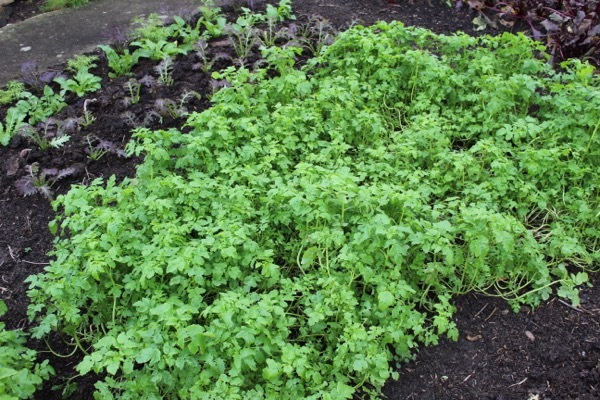 Do watch for new weed growth and pull them when seen, to save yourself a big job in the spring. 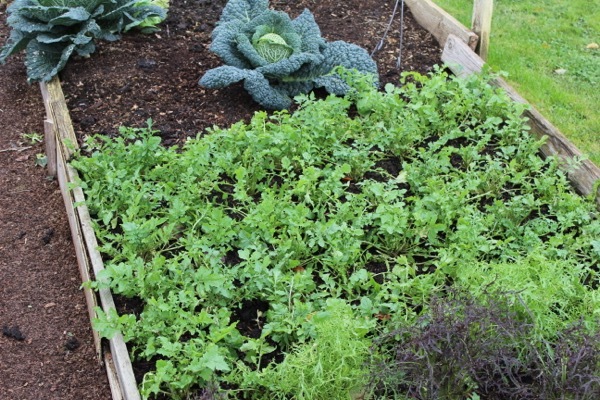 Weed growth is a downside of the warm weather, as are pests like caterpillars and slugs. 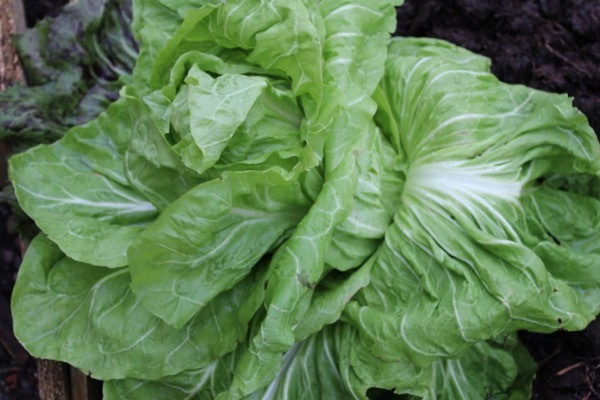 Keep the garden as tidy as possible to give less habitat to slugs – remove yellowing leaves on brassicas for example, and on larger plots its worth having beds without wooden sides, on heavy soils and damp areas. These photos, covering just two weeks in the second half of November, show how mild it has been. My next job is to cut down the asparagus. 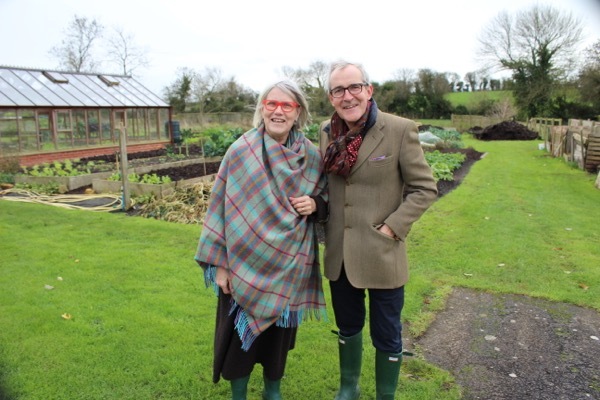 On 28th I was honoured to welcome Darina Allen and Rory O’Connell her brother, who founded Ballymaloe Cookery School and restaurant in the 1980s. 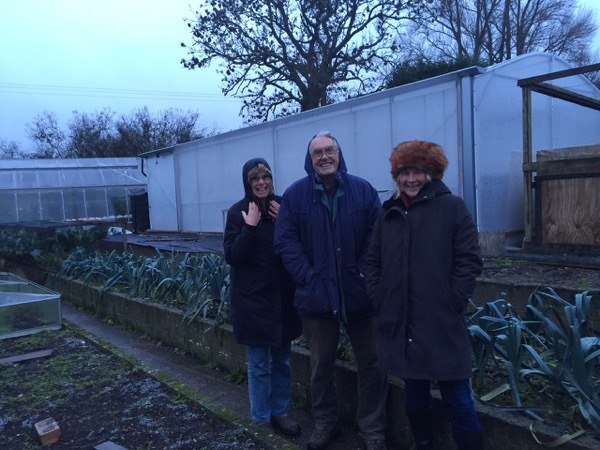 They favour home cooking and with plenty of vegetables, in fact there is an acre of greenhouses in their gardens. 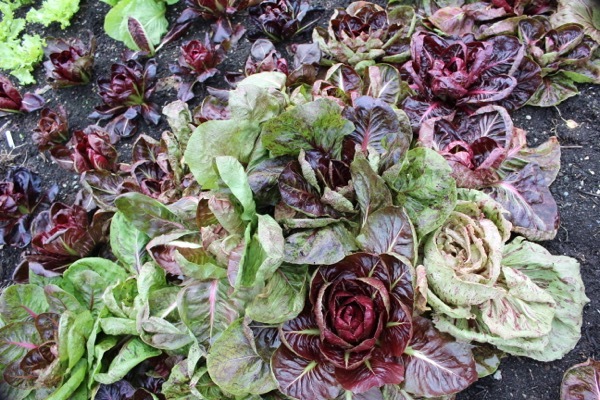 Darina says she likes chefs to have spent proper time growing vegetables before cooking them, so they appreciate what is involved and have best knowledge of the produce. 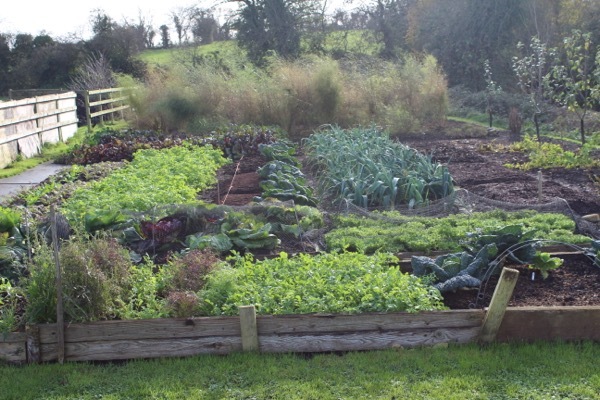 At Homeacres, Darina and Rory loved the productivity and lack of weeds, so they are taking no dig ideas home to Ireland. 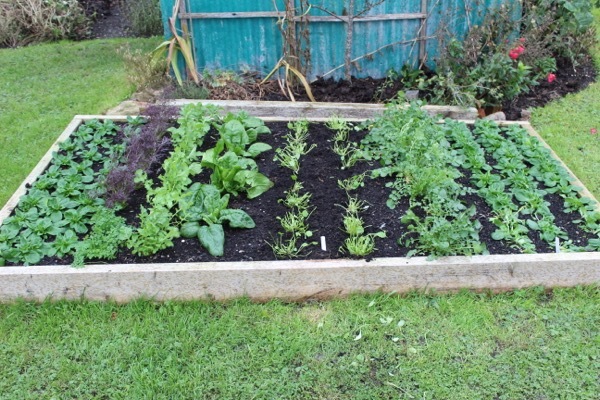 I find that the best outdoor salads in a mild December are American land cress, lambs lettuce, spinach Medania and the mustards. 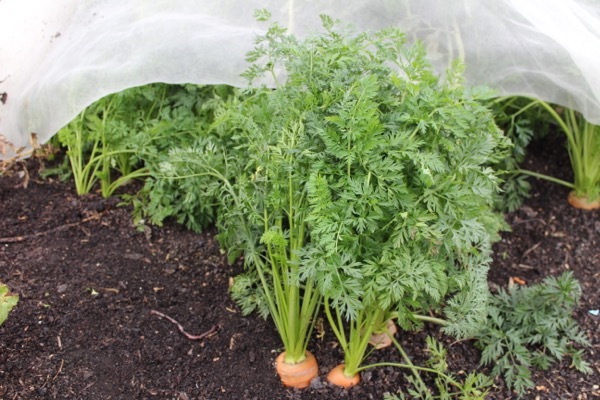 I was pretty impressed by how Darina and Rory both homed in on my Synapsis alba (agricultural mustard, green manure) which I broadcast September 20th after clearing Kuri squash. They loved it! so there you are, a dual purpose plant. My local rabbits are backing them up, choosing this mustard ahead of the nearby Frills, rocket and even parsley! 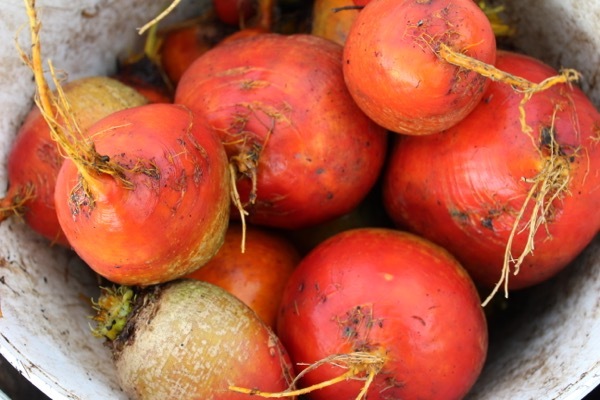 After the frost I harvested some of my remaining beetroot. 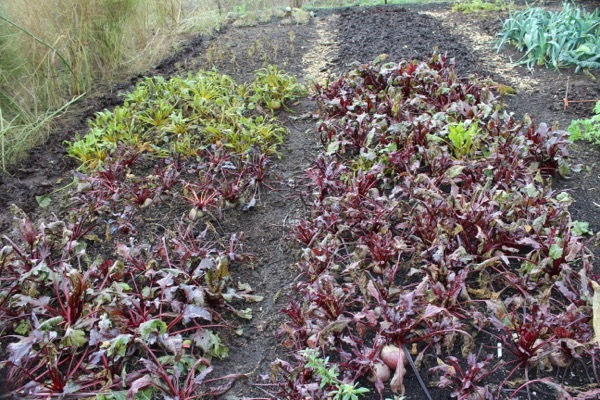 A few of the golden beetroots’ leaves were singed by frost but at -3C it was not cold enough to harm the roots. On the other hand, slugs were accumulating in some of the clumps so all in all, many root vegetables are better in the barn or shed. I keep them in crates. 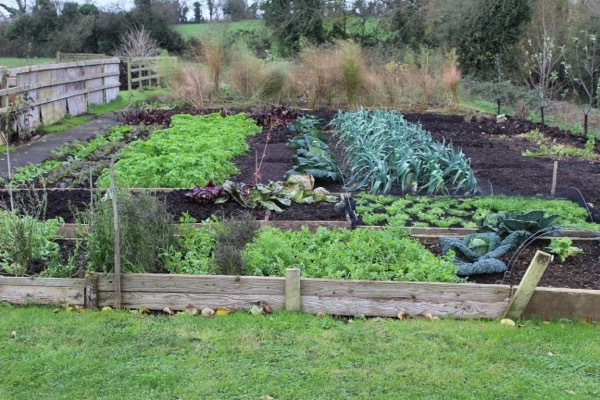 The bed here was planted on June 29th after a last harvest of broad beans, which had been sown in mid November. It was dry at planting time and I gave some water, after that there was almost no more time needed as weed growth was so small, maybe ten weeds over the whole summer in that area. 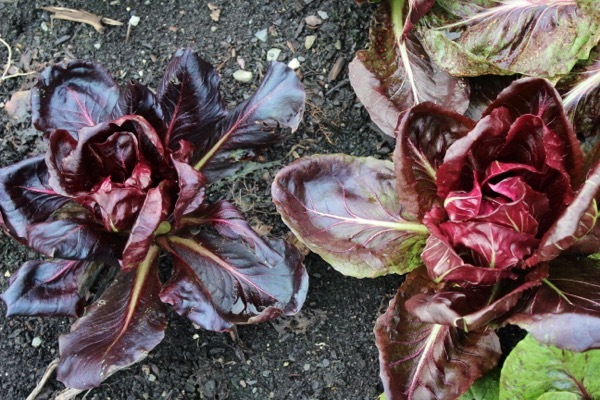 A bonus harvest was baby beetroot leaves for my salad bags, both red and yellow, their depth of colour is extraordinary. My talks have been popular and that it reflects in book sales. The 25 ladies of Alhampton lunch club bought 26 books, mostly Myths, many as Christmas presents. 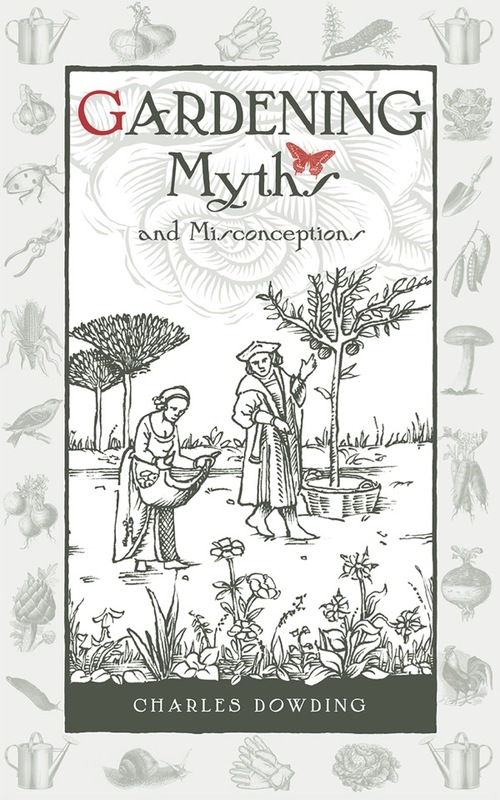 Then there were 90 people at my talk in Bucks, after which we stayed the night with John and Jill Branham, who are amazing gardeners, John wins many prizes . 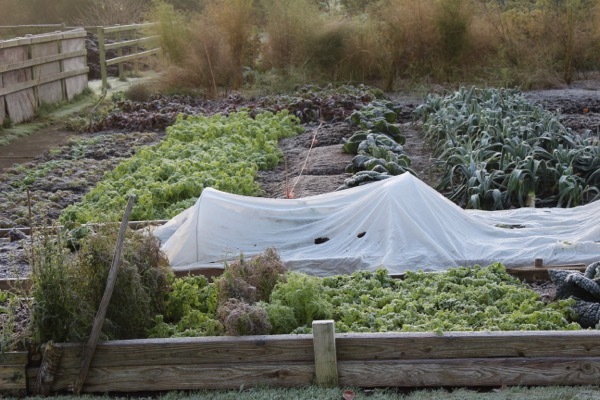 My photo on a morning when it was snowing lightly does not do justice to his fine vegetables, which are dotted around the beds and mostly undercover now. The gardeners question time at Blandford was good but paled by comparison with the discussion in the forum here! 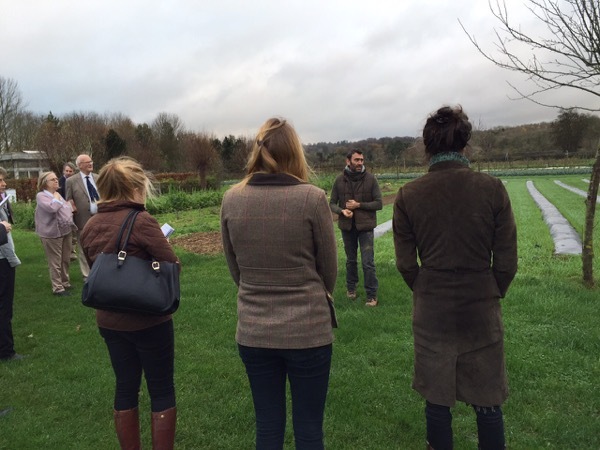 I was invited to a launch of Agricology farming advisory service, at Daylesford organic farm in Gloucestershire. The 81 mile drive took nearly 3 hours but it was worth it, especially to see Jez Taylor’s work in the 20 acre market garden. 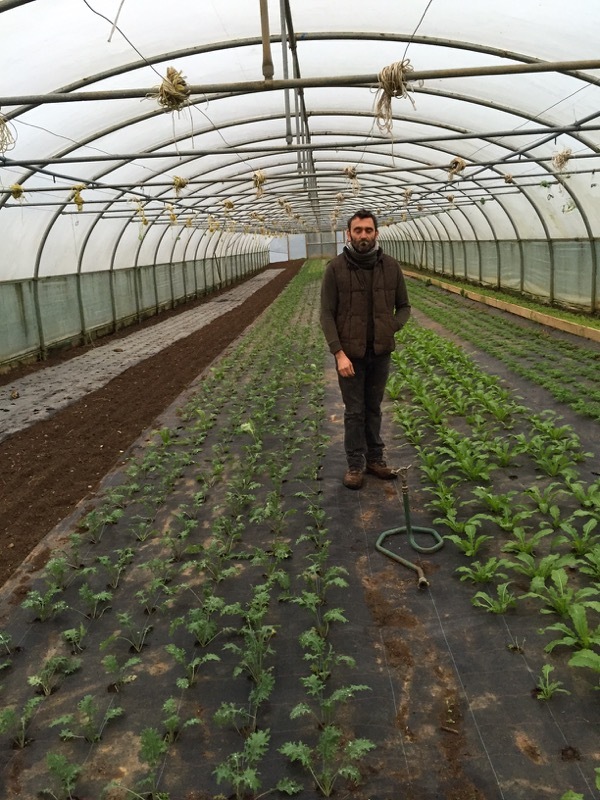 Its a different scale to Homeacres as he grows a wide range of crops for 4 busy shops, a ready meals unit and 4 restaurants. 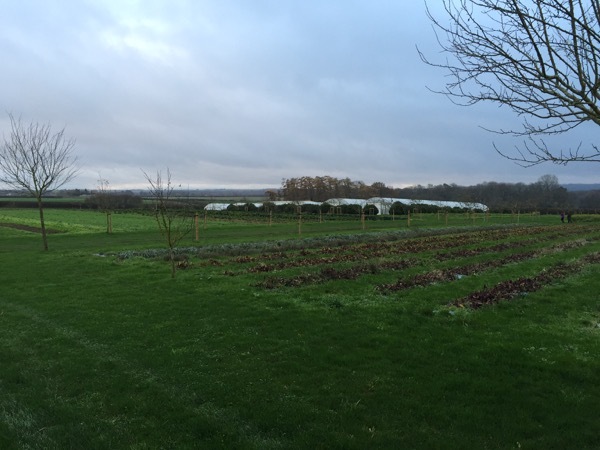 Last week they picked 90kg salad plus leeks, kale, chard, parsnip, celeriac and beetroot, and in their spare time (!) they are making wreaths to sell, of foraged plants on a homemade willow base. As long as the night temperatures have stayed above about -6c, chicories continue to look good and grow a little. Hearts are most vulnerable to frost and I harvested many just before, a few I covered with fleece, and all the less-hearted chicories are still outside, looking wonderful. They taste good too as long as you accept some bitterness, being which is plenty of flavour and sweetness too, especially in the Sugarloaf. 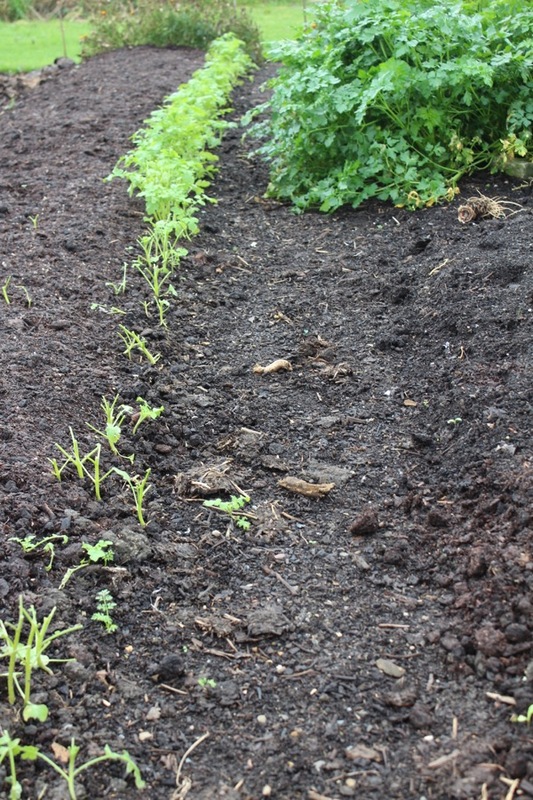 it was sown July 14th and planted after broad bean. When will Radio 4 be broadcasting “your” GQT episode? There is no sign of it on their schedule and I don’t want to miss it! Thanks compostpope, t was a local GQT and not a Radio 4 one sadly. Thanks for your comment and its to do with the size of an orange (fruit! 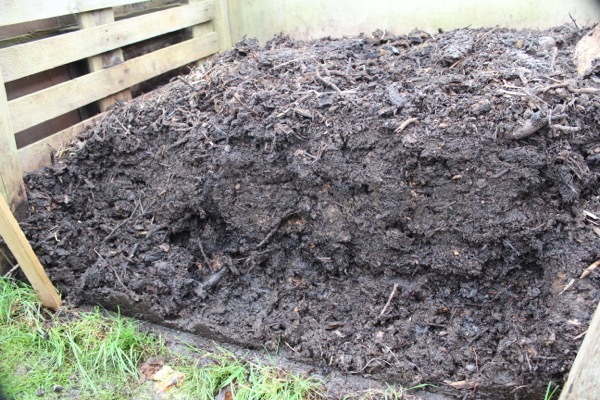 ), to break up lumps of compost/manure before spreading them on the soil surface.